Tony has been upset with me for quite some time, and with good reason. Here he is, half the team – arguably the more important half – and his esteemed teammate and buddy (yours truly) has neglected to properly introduce the entrepid soul. As I type this we have made the city of Guanajuato, right smack dab in the middle of Mexico. Together we have ridden around 5,500km during which we have crossed eight mexican states, two time zones, and one international border, and STILL I haven’t given the hombre his day in the spotlight! Well now is the time. Tony’s full name is Anthony Abbot Oso Trek. He comes from the Trek family, specifically the 6700 branch of the family tree. Born back in 2006 (we think), he was sent off at an early age to a bicycle shop in La Jolla, California, USA before being sold to an evil man in Chula Vista. It was on a cramped apartment balcony with two other bicycles that Tony was to then pass what should have been the best years of his years. He was a prisoner, and very rarely was he let out of his pen for the fresh mountain air he was born to thrive on. Finally, at the age of six his evil owner decided to sell Anthony Abbot Oso Trek and posted an ad on Craigslist. Finally destiny would shine on young Tony as it was this ad that caught my attention. 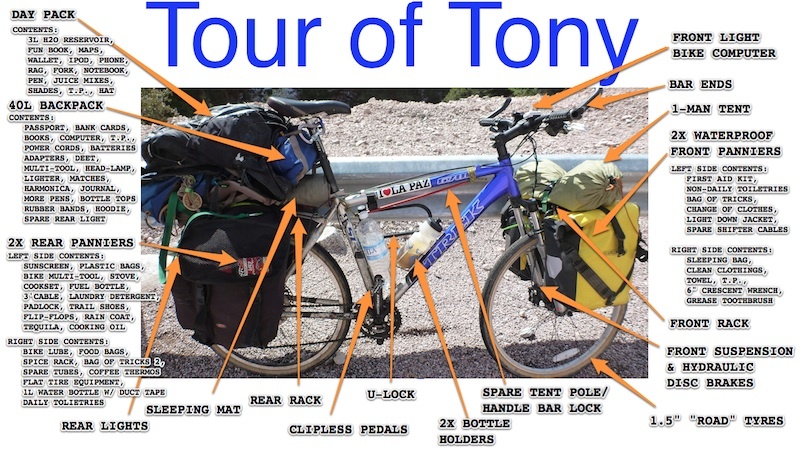 As a matter of fact, Tony was the very first bicycle I went to have a look at, and when I saw this strong, resilient, restless spirit of a bike being forced to live in the most dire of conditions (couldn’t even see the TV!) I knew that fate had brought us together and that I had to set this bike free. And the rest, as they say is history. Other things you might like to know about Tony: Tony thinks he’s the boss of this team and often stubbornly misbehaves at the most inopportune moments. Tony is a single bike (ladies…) but often acts awkwardly around lady bicycles. Tony hates long walks on the beach at sunset with an intense passion. Instead, he prefers riding along the ridges of mountain ranges at sunrise. Tony thinks the world of me, but will never admit it to my face. Finally the picture below is a tour of all of Tony’s intimate parts. Since the picture has been taken we have only added on a horn, and lost a front light. Click on the photo to make it more legible.